This article is about the bowed instrument. For the Central Asian plucked instrument, see Rubab (instrument). For the rebab used by Sikh musicians, see Seni rebab. The rebab (Arabic: ربابة‎, rabāba, variously spelled rebap, rabab, rebeb, rababa and rabeba, also known as جوزه jawza or djooza in Iraq) is a type of a bowed string instrument so named no later than the 8th century and spread via Islamic trading routes over much of North Africa, the Middle East, parts of Europe, and the Far East. The bowed variety often has a spike at the bottom to rest on the ground (see first image to the right), and is thus called a spike fiddle in certain areas, but plucked versions like the kabuli rebab (sometimes referred to as the robab or rubab) also exist. The Arabic rabāb is the earliest known bowed instrument and the parent of the medieval European rebec. The Arabic rabāb is the ancestor of all European bowed instruments, including the rebec and the lyra. Besides the spike fiddle variant, there also exists a variant with a pear-shaped body, quite similar to the Byzantine lyra and the Cretan lyra. This latter variant travelled to western Europe in the 11th century, and became the rebec. The rebab, though valued for its voice-like tone, has a very limited range (a little over an octave), and was gradually replaced throughout much of the Arab world by the violin and kemenche. The Iraqi version of the instrument (jawza or joza) has four strings. The rebab is used in a wide variety of musical ensembles and genres, corresponding with its wide distribution, and is built and played somewhat differently in different areas. 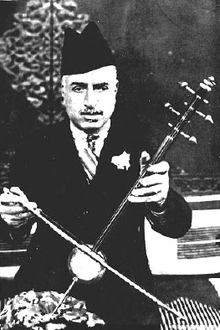 Following the principle of construction in Iran, the rebab is a large instrument with a range similar to the viola da gamba, whereas versions of the instrument further west tend to be smaller and higher-pitched. The body varies from being ornately carved, as in Java, to simpler models such as the 2-string Egyptian "fiddle of the Nile." They may have a body made of half a coconut shell, while the more sophisticated versions have a metal soundbox, and the front may be half-covered with beaten copper, and half with cowskin. 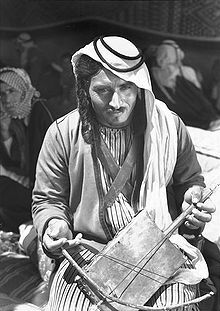 The rebab was heavily used, and continues to be used, in Arabic Bedouin music as well traditional Iraqi music under the name "joza", named after the sound box material made of a coconut shell . There is also a bowed instrument in Persian music named Kamanche which has similar shape and structure. For a famous Iranian singer and rebab player see Hassaan Egzaar Chenani. The spike fiddle variants are very commonly used by many North, East and Central Asian ethnic groups and their diaspora around the world, such as the Huqin variety used by most ethnic groups of China, the khoochir and morin khuur of Mongolia, the Byzaanchy of Tuva, the Haegeum of Korea, kyl kiak of Kyrgyzstan, Saw sam sai of Thailand and many others. 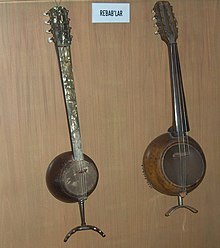 These are generally used in playing traditional folk tunes, but have also become popular in arrangements of contemporary music, including such genres as classical, jazz, and rock. In the Indonesian gamelan the rebab is an essential elaborating instrument, ornamenting the basic melody. A two-string bowed lute consisting of a wooden body, traditionally though now rarely a single coconut shell, covered with very fine stretched skin. Two brass strings are tuned a fifth apart and the horse hair bow is tied loosely (unlike modern Western stringed instruments) with the proper tension controlled by the players bow hand, contributing to the difficult technique. There are typically two per ensemble, one for pelog and one for slendro, never played together. 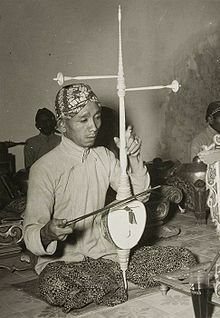 The rebab does not have to conform exactly to the scale of the other gamelan instruments and can be played in relatively free time, finishing its phrases after the beat of the gong ageng (the big gong that "rules" the ensemble, see: colotomy). The rebab also frequently plays the buka when it is part of the ensemble. In the eastern Malaysian states of Kelantan and Terengganu, the Rebab is used in a healing ritual called "Main Puteri". The musician healer is sometimes taken to hospitals in cases where doctors are unable to heal ailing patients. The Cantigas de Santa Maria, c. 1260, captured some of the musical instruments introduced from Muslim dominated Andalusia to Southern Europe. The plucked and bowed versions existed alongside each other. The bowed instruments became the rebec or rabel and the plucked instruments became the gittern. Curt Sachs linked this instrument with the mandola, the kopuz and the gambus, and named the bowed version rabâb. Ektara, one-string instrument used in traditional music from Bangladesh, Egypt, India, and Pakistan. ^ a b "rabab (musical instrument) - Encyclopædia Britannica". Britannica.com. Retrieved 2013-08-17. ^ "Erhu - Chinese violin / fiddle with two strings - and Erhu music (audio & video demo)". Philmultic.com. Retrieved 2013-08-17. ^ a b c Lindsay, Jennifer (1992). Rabab is one of traditional music instrument in Minangkabau especially in west coast region like Pesisir Selatan dan Pariaman https://niadilova.wordpress.com/2017/03/13/rabab-pariaman-senjakala-sebuah-genre-sastra-lisan-minangkabau/. Javanese Gamelan, p.30-31. ISBN 0-19-588582-1. ^ a b Sachs, Curt (1940). The History of Musical Instruments. New York: W. W. Norton & Company. pp. 151–153. Wikimedia Commons has media related to Rebáb (Maghreb). Wikisource has the text of the 1911 Encyclopædia Britannica article Rebab. FERNWOOD, an American music group that uses a Rebab.